All right – you know you like doughnuts. If you don’t, please don’t contact us. I’m not sure we can work with you. 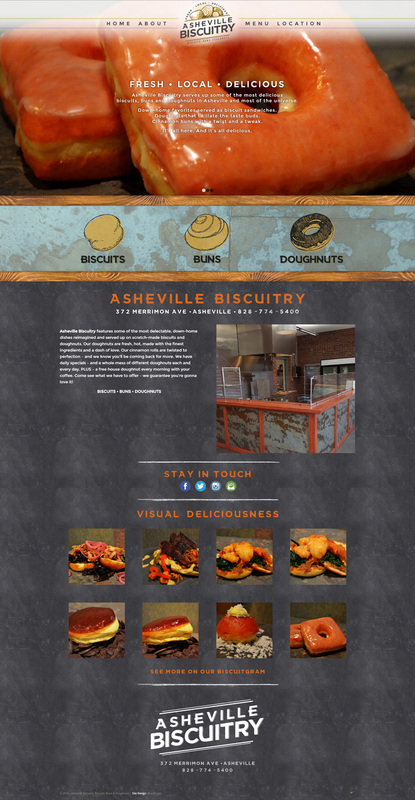 Anyway – Asheville Biscuitry opened a new restaurant in Asheville, and we got to work with them through the entire process – branding, signage, web, social – everything. Their site is built using WordPress and the Enfold theme. Lots of custom design makes this fully responsive site look like a million bucks. Or a million pounds. Asheville Biscuitry is over on Merrimon – and they have KILLER food. Their doughnuts are terrific, their prices are reasonable and Brian, their head chef is a hell of a dude. Stop by and get a cup of Penny Cup Coffee and a doughnut and tell them we sent you. They might kick you out – but you’ll have a tasty, tasty treat.